Something has gone horribly wrong. We must evacuate the colony immediately. All available Evacuation Transports have been filled to capacity and are ready to leave. 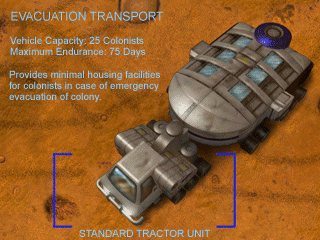 Our survivability projections have identified the vehicles and supplies we need to build a viable new colony. Gather these materials and rendezvous at the mining beacon southeast of our colony. An exact list of needed materials is available in the Specific Objectives. Hurry, Commander. Time is running out. Move all units and their cargoes to the mining beacon southeast of our colony.